Red-winged Grasshoppers (Arphia pseudonietana) are found in the grasslands and prairies of western and central North America. Here in Arizona, these large, grass-eating grasshoppers can be observed in open grassy areas throughout most of the state. I observed this Red-winged Grasshopper below and numerous others in an upland area of mixed grass and shrubs above Buehman Canyon, Arizona. A Red-winged Grasshopper is solid black or speckled dark brown to gray in color with a similarly colored hind tibia (leg segment below the knee) and bright red hindwings edged with a black to clear marginal band. Although most Red-winged Grasshoppers have red wings, some local northeastern populations have yellow wings. Here in southeastern Arizona, black Red-winged Grasshoppers are quite common, but they are not the only black grasshopper found here. 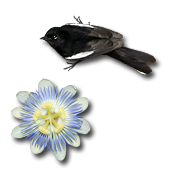 Male Ebony Grasshoppers (Boopedon nubilum) are also black, but they have blue wings, which are only visible in flight. Red-winged Grasshoppers are frequent fliers, especially the males as they engage in a variety of flight displays to attract a mate. Red-winged Grasshoppers will also quickly take flight if flushed. Like other Band-winged Grasshoppers (Subfamily Oedipodinae), Red-winged Grasshoppers produce a loud rattling sound known as crepitation as they fly. Grasshoppers produce sound by either stridulation or crepitation. Stridulation is the sound produced when a grasshopper rubs its hind femur (leg segment above the knee) against its body, while crepitation is the sound produced when a grasshopper rapidly flexes and snaps its wings taut in flight. 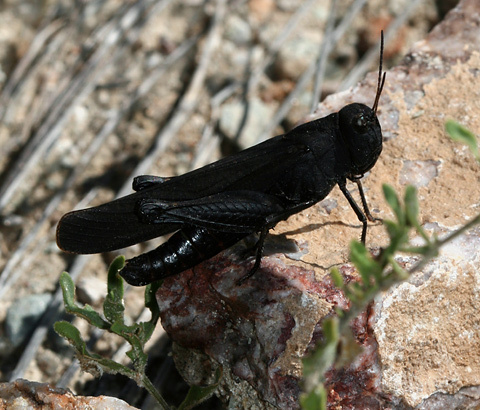 The rattling of flying Red-winged Grasshoppers is one of the characteristic sounds of late summer in the grasslands and uplands of southeastern Arizona, and this is the best time of the year to observe these unusual black grasshoppers here.